If you've got an Android phone and you're on the hunt for a smartwatch, you're in the right place. Below we've ranked all the greatest pieces of techy wristwear that will connect to your Android handset. This isn't a list of the best Wear OS watches or the best smartwatches overall. Instead this list is specifically for devices that will connect to your Android phone, which means there's a selection of Samsung watches sporting Tizen as well as Fitbit and Wear OS options. Below we'll talk you through the best options for your wrist, but if you're looking for more choices we have a full selection of guides that may sort you out just below. 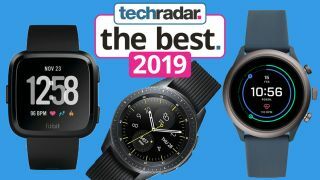 Every watch in our ranking here has been tested to the limit through our review process, and we've put this list together with consideration for the features each watch offers as well as the design, display, fitness potential, price and more. Want the best smartwatch to connect to your Android phone? That's the Samsung Galaxy Watch, which the company released in the second half of 2018. This comes running Tizen software, but it works well with Android devices and gives you lots of apps to choose from. It's a great choice for tracking your fitness, but it also sports top-end specs and a premium design that's suitable for everyday wear. Perhaps our favorite feature is the rotating bezel that allows you to cycle through menus and apps with ease. You've got the choice of 46mm or 42mm sizes, which means it should suit most wrist sizes - and if you opt for the smaller model it's a bit cheaper too. This is the first watch - of many - in this list that comes with Wear OS software on board. It's the Fossil Sport, and it's arguably one of the first watches from the company that can keep pace with the likes of the Samsung Galaxy Watch and Apple Watch. It's lightweight, so it's comfortable for a variety of exercises, and it's built with fitness in mind with GPS and an accurate heart rate monitor included. Despite its sporty focus the design still feels premium, and it's one of the most powerful devices on this list as it comes with the latest Qualcomm Snapdragon Wear 3100 chipset inside. That's not in a lot of other Wear OS watches yet, and we found it noticeably slicker than some other choices. Fitbit hasn't been making smartwatches for very long, but the company has got it right with its second model. It's called the Fitbit Versa, and it may not be the most impressive overall smartwatch but it's good for those who want to improve their fitness. It's light, small and connects with your Android phone simply and easily. We particularly like the accurate heart rate sensor and its overall fitness focus with lots of workout modes packed in. If you're looking for a smartwatch that can run lots of apps for messaging and a variety of other features, this probably isn't it. But if you want something that can track all your fitness stats while looking good on your wrist, the Fitbit Versa may be for you. Bear in mind that there's also now the Fitbit Versa Lite. It's missing features like Fitbit Pay and a few of the workouts, but if you want a cheaper device and like the look here, the Versa Lite may be the watch for you. Now it's time for one of the cheapest devices on this list, and it comes from Chinese manufacturer Mobvoi. The TicWatch E2 isn't a huge improvement on the first-gen watch, but it offers some fantastic features considering its price. We really like the two-day battery life and the fact you can get all of the features of Wear OS on a watch for this low a price. It's quite an impressive feat, and that's why it ranks so highly in our best Android watch list. There's no NFC (so no Google Pay) but we can forgive that at this price, especially as you do get GPS and a heart rate monitor. Want a unique Wear OS experience? The TicWatch Pro isn't as cheap as the device above, but it comes with two displays. That doesn't mean there's one on the top and one on the bit that sits on your wrist. Instead, one is a see-through display that allows you to have a low-battery mode that keeps the essential features running even when you're almost out of charge. Then on top of that there's a normal Wear OS screen, for when you're able to turn on all of the features and charge it up every couple of days. It won't be to everyone's taste, but the TicWatch Pro is a premium device with a more affordable price tag than a lot of the other choices you'll find on the market right now. It costs slightly more though, so if you're not a huge fan of the design we'd recommend opting for TicWatch E2 instead. If you do like it and you're willing to spend a bit extra, you'll get some decent specs and features here, including a 1.39-inch 400 x 400 display, a heart rate monitor and GPS. Then there's the Fitbit Ionic. It's both bigger and more expensive than the Fitbit Versa above, but the big benefit is it comes with GPS onboard. That makes this the best running watch from Fitbit, and you've got all of the benefits of a Fitbit device ready and waiting. You can download a variety of apps and watch faces to this device, but be warned that it won't be a huge selection like you'd get on a Wear OS or Tizen smartwatch. Instead, this is much more fitness-focused and if that's what you're looking for this won't be a terrible choice for you. That said, if you want a fitness device and aren't bothered about GPS then the Fitbit Versa is a cheaper alternative with many of the same features. It has an attractive and premium look, so you won't be embarrassed to wear this on a night out, but it's also suitable for you to go running with or on a cycle using the built-in GPS. Plus it comes with NFC, so you can make contactless payments. It does use the older Snapdragon 2100 chipset, so it will be slower than the Fossil Sport above, but if you prefer the look of the Vapor 2 you won't be missing out on much by choosing it.